Sherlock Holmes is back at Pro Se Productions, and this time he’s not alone. Author Brad Sinor’s THE GAME’S AFOOT: A HOLMESIAN MISCELLANY, a collection of Holmes related tales, is now available in print and ebook editions from Pro Se Productions. Featuring an iconic cover by Jeffrey Hayes and cover design and print formatting by Antonino Lo Iacono, THE GAME’S AFOOT: A HOLMESIAN MISCELLANY is available now at Amazon at https://www.amazon.com/Games-Afoot-Holmesian-Miscellany/dp/1535202505/ref=sr_1_1?ie=UTF8&qid=1471626057&sr=8-1&keywords=the+game%27s+afoot+sinor and Pro Se’s own store at www.prose-press.com for 15.00. 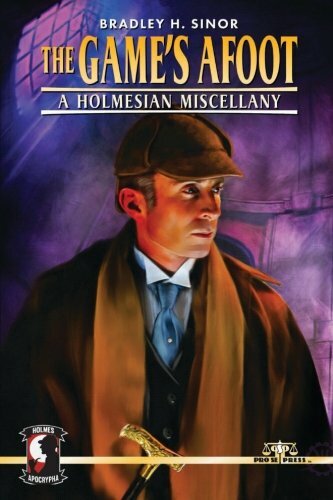 This imaginative Holmes collection, a part of Pro Se's HOLMES APOCHRYPHA line, is also available as an Ebook, designed and formatted by Lo Iacono for only $2.99 for the Kindle at https://www.amazon.com/Game-Afoot-Holmesian-Miscellany-ebook/dp/B01KP6KFMG/ref=sr_1_1?ie=UTF8&qid=1471708780&sr=8-1&keywords=the+game%27s+afoot+sinor and for most digital formats via Smashwords at https://www.smashwords.com/books/view/659430.